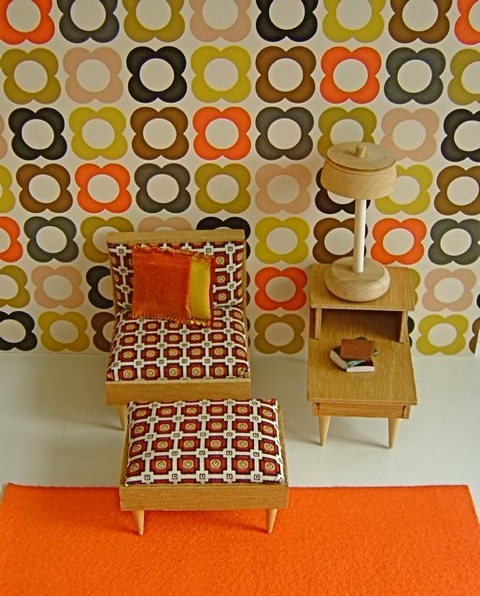 SOFA, CHAIR, OTTOMAN, END TABLE AND COFFEE TABLE: Archetypal items featuring the fashionable low-slung, squared-off styling, and sharply-tapered legs so popular during the 1950's-1970's. This high-quality, matching suite is upholstered in a fashionable geometric print and sports handmade velvet scatter cushions. A handmade lamp and a small stack of books sit on the end table; on the coffee table, there are three white ceramic mugs and three plates of chocolate roulade. 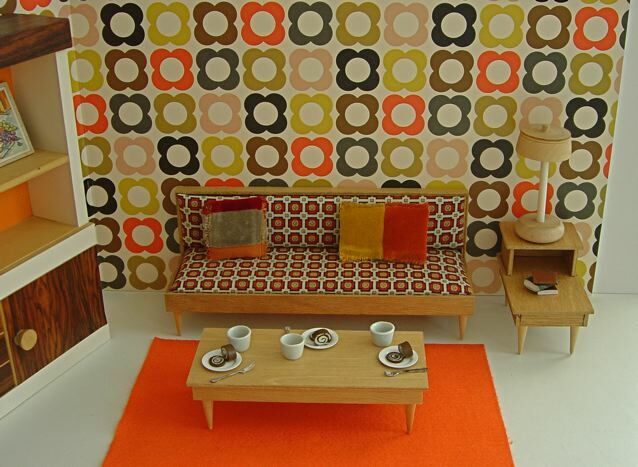 All the furniture was made by Arco, a Hong Kong-based division of Mattel, during the mid-century years. Difficult of find now, these are wonderfully evocative of the era. BOOKCASE: A chic, nicely-made bookcase, constructed either by an incredibly talented craftsperson or possibly factory made (although there are no manufacturer's marks). 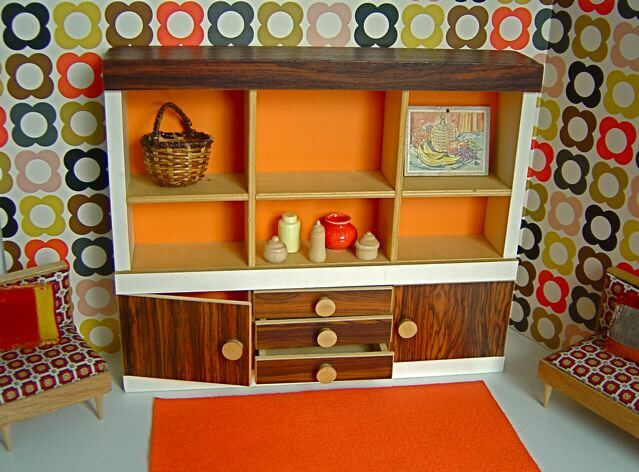 The bookcase is made from a combination of period-correct materials, from the rosewood- grained laminate to the pine drawer knobs, making it a tiny replica of the full-sized furniture produced at the time. In the shelves, the following vintage items: a lovely basket, a selection of ceramic and wooden vases, and a still life 'painting'. LAMP: A handmade lamp with wooden base and wooden lampshade. RUG: Hand-made from a piece of orange felt. Dolls: DOLLS: Chosen from our selection of vintage dolls. 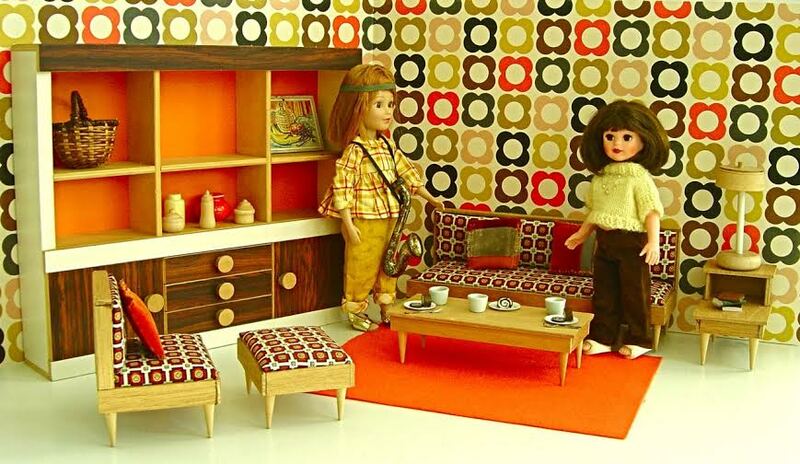 Shown here, an unusual, auburn-haired, teenage Madame Alexander doll on the left and a brunette Kripplebush Kids doll on the right, both dolls in ‘70’s style clothing; both dolls available from the DOLLS section of this website. Note that there are lots of other clothes available for these dolls – please see the CLOTHING section of our website for an idea of what is available.